On 20 April 2018, IHS Jane’s reported that the Indian Air Force (IAF) had formally ended its involvement in the Fifth Generation Fighter Aircraft (FGFA) it had started with Russia in 2007. Official confirmation has yet to come from New Delhi, but reports of the IAF’s discontent with several key aspects of the Sukhoi T-50/Su-57 PAK-FA – i.e. the platform from which the FGFA was to be derived – had trickled through the past year. The IAF’s concerns include dissatisfaction over the PAK-FA’s radar cross-section (RCS)-reduction work (i.e. stealth) and the quality of its onboard electronics, most notably the radar. This is a significant event in that it alters the long-term value of bilateral Indian-Russian defence relations. Granted, there are still numerous big-ticket programs poised to reach fruition, not least a joint-production program involving the Kamov Ka-226T and continued cooperation on T-90-series main battle tanks (MBT). The continuation of the IAF’s Su-30MKI program – i.e. ongoing support and potentially upgrades – is also a potential area of interest between Moscow and New Delhi. 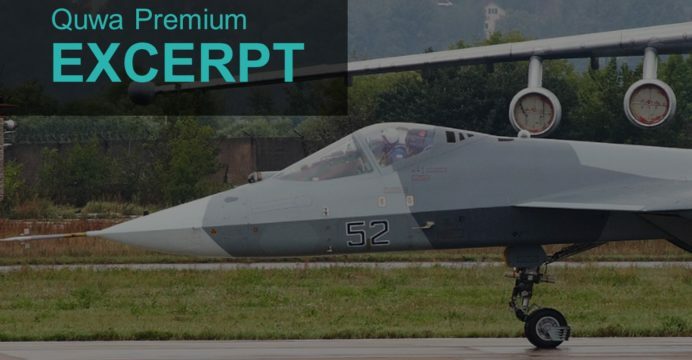 However, fighter aircraft are arguably the biggest-ticket items in that they not only have to be bought in sizable numbers, but will amount to several hundred million dollars – each – in acquisition and long-term support costs. By closing the door on the FGFA the IAF has effectively closed the door on Russia securing a new wave of fighter orders – and in turn, a leading revenue-generator for Moscow – in India. India signed onto the FGFA in 2007. Pegged as the “largest joint project” in the history of Russia and India’s defence relations, the FGFA’s development alone was to reach a cost of $8 to $10 billion US. In 2010, both India and Russia signed a $295 m preliminary design contract. This was joined in 2013 with a contract to formally develop the FGFA as a variant of the PAK-FA – i.e. tailor the PAK-FA to the requirements of the IAF. It was thought that the IAF would gradually supplant its Su-30MKIs with the FGFA, benefitting from both a deep level of transfer-of-technology (ToT) and economies-of-scale through leveraging the fighter requirements of both countries. In totality, the FGFA would have arguably dwarfed all prior Indo-Russian defence programs in its scale and cumulative economic value. Complete Article is Available on Quwa Premium (link). Rahul Bedi & Reuben F. Johnson. “India withdraws from FGFA project, leaving Russia to go it alone”. IHS Jane’s Defence Weekly. 20 April 2018. URL: http://www.janes.com/article/79457/india-withdraws-from-fgfa-project-leaving-russia-to-go-it-alone (Last Accessed: 22 April 2018). Press Release. “The contract to develop a sketch and technical project of the Russian-Indian 5th -generation fighter was completed”. Sukhoi. 10 April 2013. URL: https://web.archive.org/web/20130503002346/http://www.sukhoi.org/eng/news/company/?id=5125 (Last Accessed: 22 April 2018).